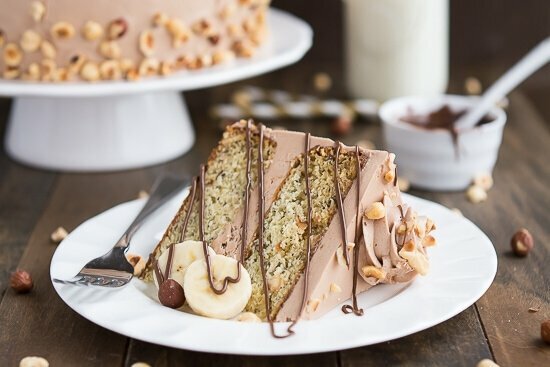 Banana Hazelnut Cake is the perfect combination of banana, chocolate, and nuts. Taste: Perfectly sweet. 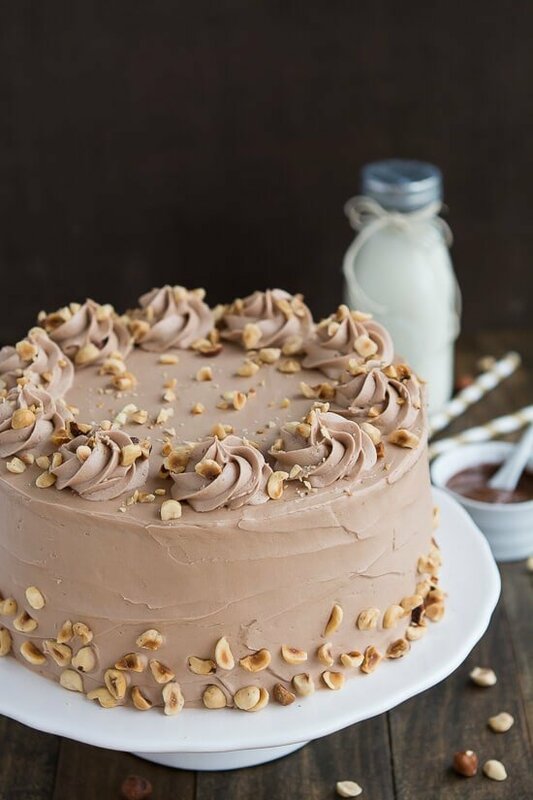 Banana flavor cake with chocolate hazelnut frosting. Texture: Light and fluffy crumb with a smooth as silk frosting. Ease: Fairly easy but does require some time to assemble. Pros: Delicious, pretty, great flavor combo and texture. Would I make this again? For sure! 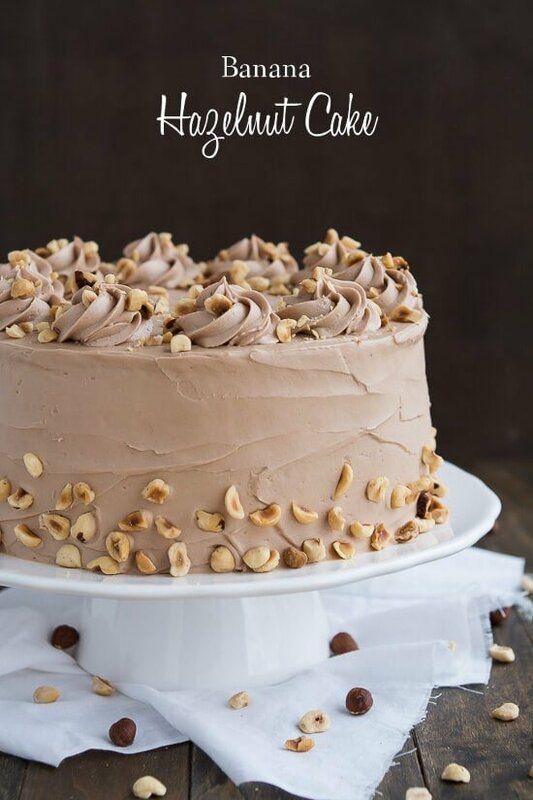 Please welcome back Melanie from Garnish and Glaze as she shares this positively gorgeous cake recipe! I don’t know about you, but I’m pretty picky with my bananas. 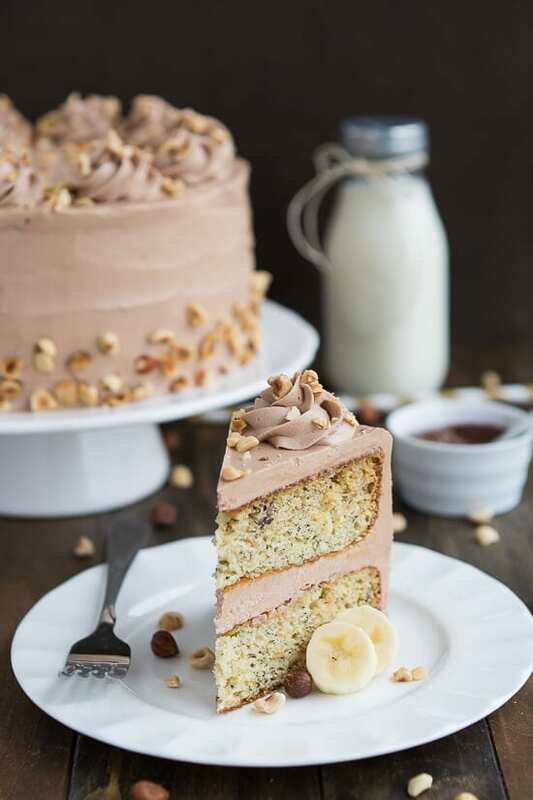 There is about a two day window of when the bananas have the perfect taste and texture and then they just get too weird to eat plain… so then I use the extras in yummy recipes like banana bread, banana coffee cake, and this amazingly gorgeous Banana Hazelnut cake. I absolutely love bananas paired with peanut butter, chocolate, or NUTELLA! Whoever invented Nutella was a genius! I love that chocolate nutty flavor. 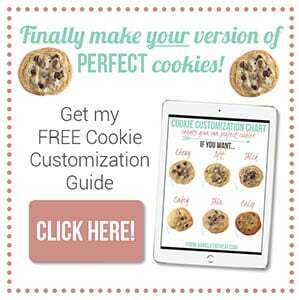 So yummy on desserts or even on breakfast foods like waffles, pancakes, and crepes. Let’s discuss this little beauty of a cake. First, the cake is perfectly sweet, bananay, and has a light and fluffy crumb. Second, the frosting is killer. It’s a silky smooth, not too sweet, and yummy chocolate/hazelnut flavor. Third, it’s got crunch and more Nutella drizzled on top if desired (who wouldn’t!?). 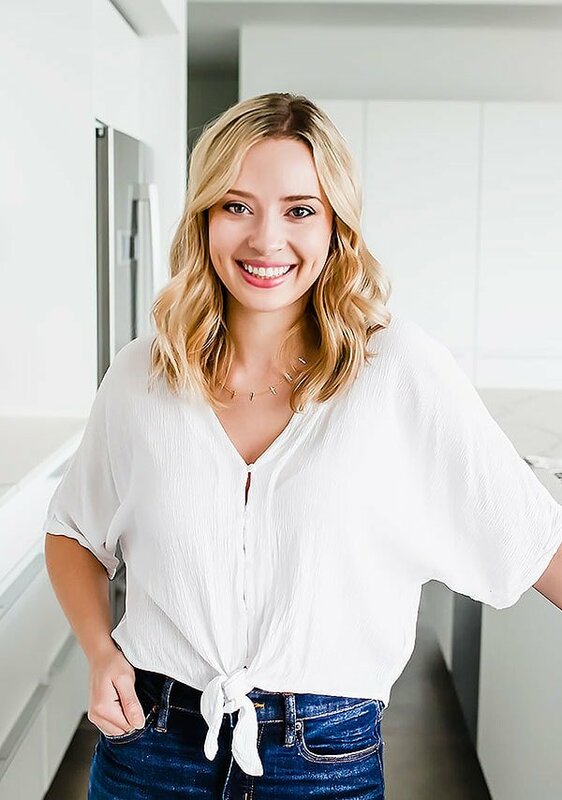 Serve it with some fresh sliced (and perfectly ripe) bananas for a lovely dessert for a dinner party. I am pretty sure ice cream would pair awesome with it as well. Preheat oven to 375°F (350° if your pans are dark). Grease and flour two 9-inch cake pans. 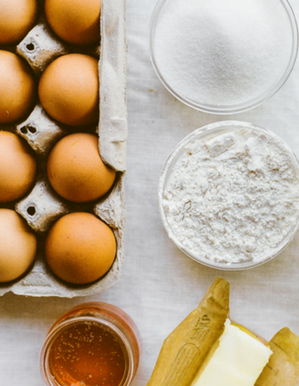 In a large mixing bowl, combine flour, starch, baking powder, soda, and salt. Set aside. In a medium mixing bowl, cream butter and sugar together. Beat in the eggs until smooth and then add the bananas and buttermilk, mixing until fully incorporated. Stir in the flour until just combined. Fold in the hazelnuts. Spread equally into two pans. Bake for 22-25 minutes until toothpick comes out clean. Let the cakes cool in the pans for 5 minutes on a cooling rack and then remove from pans onto rack to cool completely. In a small sauce pan, whisk together cream and flour. Add milk and heat over medium-high heat whisking constantly. Cook until it turns into a thick sauce like pudding. Remove from heat and pour into a shallow container. Place in fridge or freezer and stir every 5 minutes until it has cooled to at least room temperature. In the bowl of a standing mixer, use the whisk attachment to beat the butter and sugar for 2 minutes or until fluffy. Add the cooled milk mixture, Nutella, and vanilla and beat for 6-10 minutes until it comes together and is fluffy. If the frosting is too airy, switch to using the paddle attachment and beat on low for 2-4 minutes. Place one cake on a cake stand and top with one fourth of the frosting. Place the second cake on top upside-down. Apply a thin layer of frosting on the top and sides of cake to create a crumb layer. Place cake in the fridge for 30-60 minutes and then frost the top and sides. Pipe additional decorations on top. Sprinkle the top of the cake with chopped hazelnuts and press more into the sides. I totally want a giant slice of this for breakfast right now!!! Heck. Yes. What a gorgeous cake! And you’re so right about Nutella- whoever invented it deserves a medal… and a big old scoop of Nutella. Holy cow…I can’t even tell you how in love I am with this cake!! 🙂 It looks absolutely delicious!! It looks stunning! I want this to be my weeding cake, for sure. I’ll do it! Melanie, this cake looks divine! Aren’t hazelnuts the best? Especially with chocolate. I’m going to need to find an excuse to make this as soon as possible. This is indeed simple yet delicious. Definitely one to try for yourself! I think this will get me through many an afternoon-tea. Thanks for sharing, Melanie! Do you think I could replace a couple of tbsp of flour with cocoa powder? I have a request for a banana chocolate cake. Have you tried toasting the hazelnuts first? Would that be better or are the just as great Untoasted? Hi, I have some ripe bananas handy so i want to whip this great looking cake up. Question, can I just use a Nutella Swiss M, or do you suggest I should take the extra time and make the frosting you have in the recipe? Delicious recipe. Made it yesterday. My daughter liked it so much!